Abu Dhabi: Khalifa Al Amiri added to the UAE’s Special Olympics World Games gold medal haul by taking first place in the men’s long jump M18 with a leap of 5.06 metres at the Police Officers Club on Tuesday. Marcel Diessongo of Burkina Faso claimed silver with 4.82 metres while Togo’s Elom Kwami Bakpo was third with a jump of 4.23 metres. Another silver for UAE in the sand came in the M17 long-jump category when Khalid Al Hajeri finished second behind Said Razzouq (3.94 metres) of Morocco with a jump of 3.85 metres. The bronze was bagged by Poland’s Wojciech Simlat with 3.68 metres. Last night, the UAE’s medal tally was at 145 medals — 47 gold, 44 silver and 54 bronze. There will be a chance of yet more gold on Wednesday as, on the basketball court, the UAE’s unified male-mixed team avenged their first-round loss to Russia with a 29-19 win in the semi-finals at the ADNEC Basketball Arena on Tuesday. They will be meeting Puerto Rico in the final, whom they had lost to 44-32 on Sunday in the first round. The hosts had also lost their opener against Russia in a close duel 41-36 but yesterday they were pumped up from the start. “Yes, we are meeting Puerto Rico and they are formidable opponents but we are confident, having beaten Russia today. Our team is strong and you saw that. 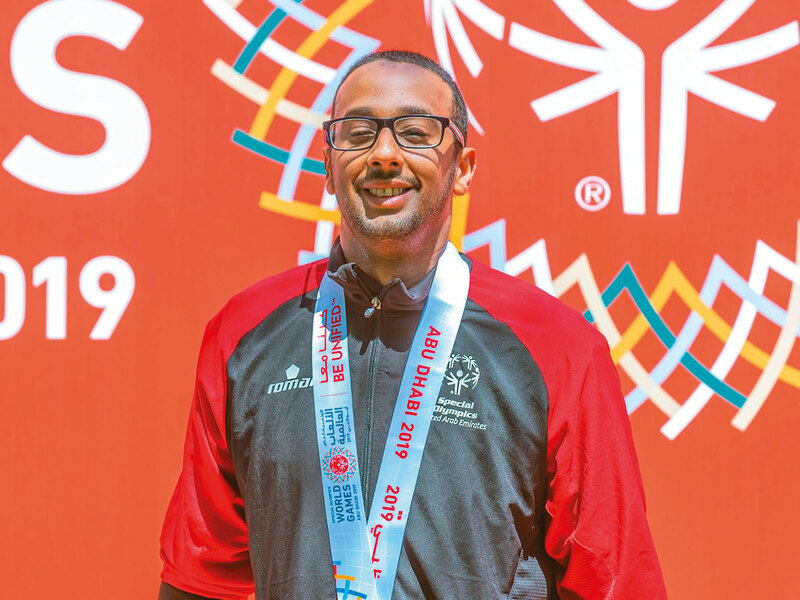 The support from so many people also helped,” said head coach Hisham Farouq, who has been working with Special Olympic teams for the past 16 years. UAE came in hard against Russia right from the start and by the end of the first period, the lead had swelled to 8-0. “It was always important to start on a high and that is what we did today. The determined boys were also very strong today and matched the able ones very well and hence the success,” said Farouq, who just didn’t want his players to drop their guard. The Russians tried to get their act together in the second and third quarter but scores of three and seven points weren’t enough to close the gap considerably as by the final quarter, the UAE led 20-10. In the final quarter, the Russians pushed hard and managed a couple of three pointers but that wasn’t enough to stop the hosts from running away with the game. The UAE will also be meeting Uganda in the final of the volleyball competition on Wednesday. They defeated Azerbaijan 2-1 in the semis played at Adnec. “We don’t feel any pressure going into the match as we are already assured of a medal. However, we are very keen to beat Uganda, who are one of the best teams here in the competition,” said UAE captain Mohammad Suleiman.